Building Blocks 2: Raise the Roof! As you can see, I’ve added a few more basic block types. I also made all color versions of the round 1×1 block, and whole bunch of roof pieces. I almost have enough to actually build something soon! Time for another sneak peek behind the scenes at something that might one day become something else! I am working on some literal building blocks at the moment that actually have lots of potential. I loved LEGO building blocks as a kid… I had them when there weren’t kits to build a specific thing with custom pieces and decals. My LEGO kits were the ones that just came in the basic colors and sizes and you had to use the entirety of your imagination but you could build anything you wanted! I still have a lot of my original ones… but they eventually passed to my sister, and now my niece and nephew play with them as well. They are durable and proved to be multi-generational in their acceptance. Who needs video games?! When I was a kid, I typically would build a house or a car or maybe both and then use the remaining blocks to build a large hammer with which to demolish the house and car I had just built. That’s how I rolled! Anyway, a convergence of several rather random events inspired me to start working on some digital building blocks. I thought, why not make some LEGO-inspired drawings… and make them the same way I would with real blocks. So, first we draw the blocks… then we use them on the screen to make pictures. No more running out of that piece you need but can’t find! For now, I’ve decided on my ten colors. 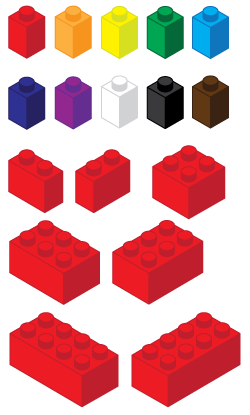 I drew the 1×1 bricks so that I could do the color testing. 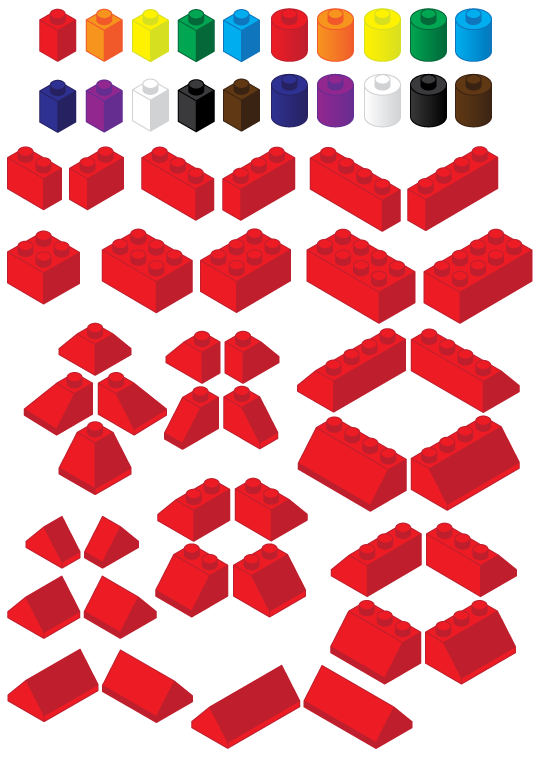 Next, I made 1×2, 2×2, 2×3, and 2×4 blocks in red. I still need to make a few more sizes and do those in the various colors before I begin to make any actual drawings. Be on the lookout for some future LEGO art on this blog.